Figure. The lesion on the patient’s back. 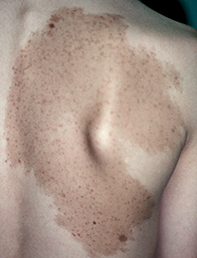 A 15-year-old boy presents with a large speckled lesion on his back (Figure). It was first noticed as an evenly coloured pale brown macule when he was about 3 years old and has since slowly acquired its speckled appearance. He is otherwise well. Becker’s naevus. This acquired lesion presents with a persistent asymmetrical area of irregular macular pigmentation on the skin and is sometimes associated with androgen sensitivity.1 A cutaneous mosaicism occurs in which the mutated skin cells become sensitised to androgen and predisposed to increased pigmentation. The skin may be more thickened in the centre of the lesion, and it is common to find that the affected area is more prone to acne and hypertrichosis. It is more common in males and is usually first noticed in adolescence. The lesions are typically located on the upper truncal region but they can occur on the face, neck and limbs. They become more obvious with increased sun exposure. It is usually managed with sun avoidance to reduce pigmentation, together with acne therapies and laser hair removal. Giant melanocytic naevus. Melanocytic naevi tend to be small, less than 1.5 cm in diameter, but giant variants (>20 cm) occur rarely. They can be present at birth (congenital) but in most cases appear later in life. Giant melanocytic naevi, although initially flat in some cases, inevitably become raised with time; they often grow long dark hair and can be associated with multiple satellite lesions. Most remain harmless throughout life and should be managed with regular monitoring. The presence of a large number of melanocytic naevi is associated with an increased risk of melanoma, and regular skin checks are therefore recommended. Giant melanocytic naevi are more prone to the development of melanoma than smaller melanocytic naevi. They are often too large to be removed completely, and excision does not negate the associated melanoma risk. McCune-Albright syndrome. This is a condition in which large café-au-lait macules are found in association with fibrodysplasia of the bone and gonadotropin-independent sexual precocity.2 This occurs due to a spontaneous somatic mutation of the gene GNAS1 during embryonic development. The severity of the condition is determined by the extent of the mosaicism of the condition in terms of the number of normal and mutated cells. The macules are of uniform colour rather than speckled, and the lesions tend to be large and macular, with pigmentation changes generally occurring within the first two years of life. It typically involves the trunk, buttocks and thighs in an asymmetrical fashion and is more extensive in areas overlying bony involvement. Most patients are asymptomatic, but bone pain, pathological fractures and limb deformities occur in in severe cases. Macular and speckled lentiginous melanocytic naevus (naevus spilus). This is the correct diagnosis. The lesions are typically large and macular with an irregular border, with irregular pigmentation within the lesion. The lesions tend to appear at birth or in childhood and may initially have the appearance of a café-au-lait macule; however, over time they develop characteristic speckling, of which some is macular and some raised. The histopathology of the darker speckles can include lentigo, melanocytic naevus, blue naevus and Spitz naevus (‘agminate Spitz naevus’). The background macular pigmentation appears as a subtle increase of basal layer melanocytes in the epidermis, which is similar to a lentigo. This lesion carries a very small risk of melanoma and should be observed for changes, but most patients retain the lesions throughout life without complications. Although a biopsy is warranted for any melanocytic naevus that has atypical features, most patients with a macular and speckled lentiginous melanocytic naevus can be managed with observation aided by clinical photography. Melanoma has been reported as a complication of macular and speckled lentiginous naevus, but this is very rare. Patients should be taught how to perform a skin self-examination and be educated about sun protection, but the overall prognosis is good. For cosmetic reasons, it is often not possible to remove a large lesion – the use of topical camouflage agents that also afford full sun protection is a better approach to management. 1. Patrizi A, Medri M, Raone B, Bianchi F, Aprile S, Neri I. Clinical characteristics of Becker’s nevus in children: report of 118 cases from Italy. Pediatr Dermatol 2012; 29: 571-574. 2. Yu AC, Ng V, Dicks-Mireaux C, Grant DB. Epidermal naevus syndrome associated with polyostotic fibrous dysplasia and central precocious puberty. Eur J Pediatr 1995; 154: 102-104.